This week I’ve been re-reading ‘God’s Smuggler,’ by Brother Andrew. Has anyone else read it? I’m enjoying it, and remembering the first time I read it, back in the early 1980’s. I was about 13 at the time, and I’d just heard about Jesus at the Christian group at high school. I was completely astounded by the love of God for each of us, and I wanted to find out more. 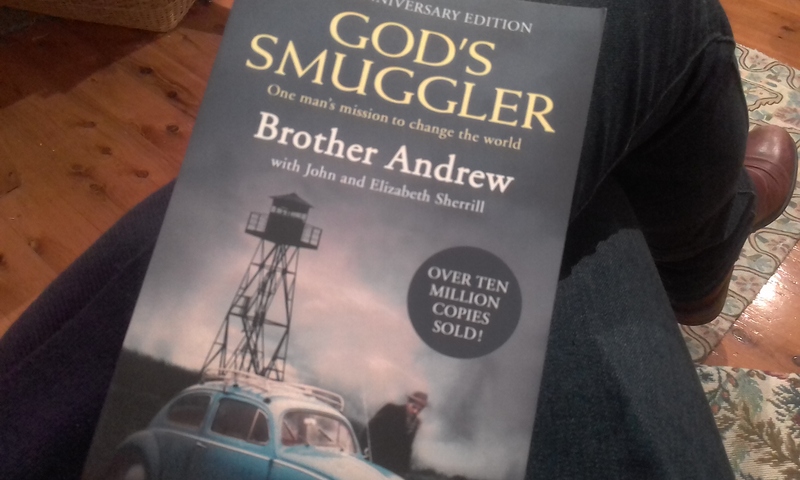 So I sat down on my bed and I read through the New Testament, and then I read every Christian biography I could find at the time, including ‘God’s Smuggler’, ‘The Hiding Place’, ‘Chasing the Dragon’, ‘Run Baby Run’, and ‘Joni’. It was a great selection of books! And I came to see that following Jesus might mean laying down my life, or my next brilliant plan, out of love for God, and his world, and it might mean sacrifice and cost, and it might even mean frightening border crossings in a blue Volkswagen full of Bibles. It could mean all of that, and more, out of obedience and love for God, because that’s how much we’ve been loved. Reading ‘God’s Smuggler’ again at almost 49, was equally as inspiring. Partly, it reminding me of our years in India and Nepal – that heightened awareness of what God was doing around us, and in us – his leading, his provision, his opportunities, his trustworthiness, in everything. I agree with him. I think I need to stop and notice indifference here, in myself, and around me, and I need to do everything I can to stop falling asleep. Sixty years after Brother Andrew’s first trip to Poland, ‘Open Doors’ (the organisation that developed from his vision) is serving millions of persecuted Christians around the world, in more than 50 different countries, in the places where having faith in Jesus costs the most. And I think that for me, and for all of us, one of the ways to stay awake is to partner with the persecuted church. Not only does it help to strengthen and enable them, the most persecuted Christians in the world, but it also, daily, widens our perspective to what God is doing through the Lord Jesus, in the costliest of places… and as we reflect on that, it hopefully keeps us more awake, to the real and ongoing needs in our street.